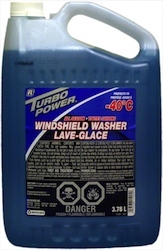 Turbo Power Windshield Washer Antifreeze products are specially developed methanol based fluids designed to provide excellent grime, salt and snow cleaning performance under cold weather conditions. A non-smear formulation, this all season windshield washer protects from freezing down to –40°C. Packaged in a new easy pour bottle the consumer can avoid spillage when filling up the vehicle’s reservoir.